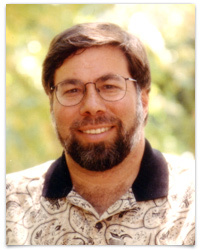 Co-founder of Apple Computers with Steve Jobs, Wozniak continues to be a major donor to numerous needy goups and students. He has received uncountable awards from technology and community groups. What a shame he gave up and quit. Reading a lot of the stories surrounding his joining, Woz was not so much interested in being a Mason as he was spending time with his wife (at the time). He does not even believe in God/Deity. He is an atheist and said he went along with the Supreme Being requirement so he could get in.